Well this is bloody unusual – it is not the morning, and I am not in bed with a cup of tea – I am sitting at my computer like a proper person! The weird reason is that I am shooting with Cuisine tomorrow and have had a quick manicure this afternoon as one of my hands might make it into the shot…consequently I can’t do anything much in case I smear my nail polish, but tapping on my computer is fine. Oh my God I am so zombied out at the moment, the last six weeks leading up to the launch of the book have been monumental, then there was the launch itself and having my darling men/boys to stay. Unfortunately Hoob was only here for two nights ( I’m heading to Welly to see him for his birthday in two weeks, hurrah, can’t wait), but Pog and Will stayed on for a week and we had such a fabulous chilled time…haha, or I did any way. I cooked a couple of nights (the ultimate vege burgers from the book one night and pizzas the other), we had a delicious dinner at Amano another, and the compulsory Thai takeaways for their final night. It is such a huge reminder of how quiet it is to live by yourself when there are other people in the house. Poor guys, I maxed out my hug quota as if I could bank them for the future! Any waaay they headed back to Melbourne on Saturday afternoon so it is back to sad-arse dinners for one for the moment. 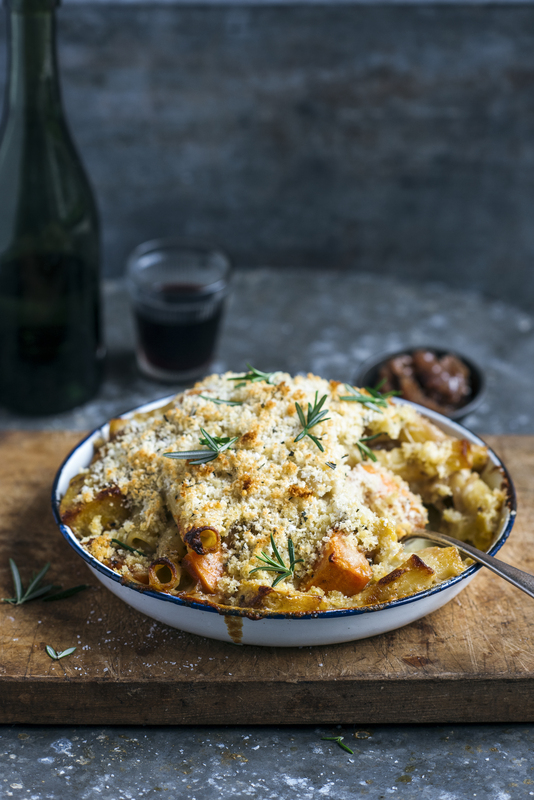 Whoops, so obsessed with having the boys here I forgot to talk about the food – this is a vego take on mac and cheese that I made for Hoobie’s last visit and which appeared in Fairfax newspapers last week. 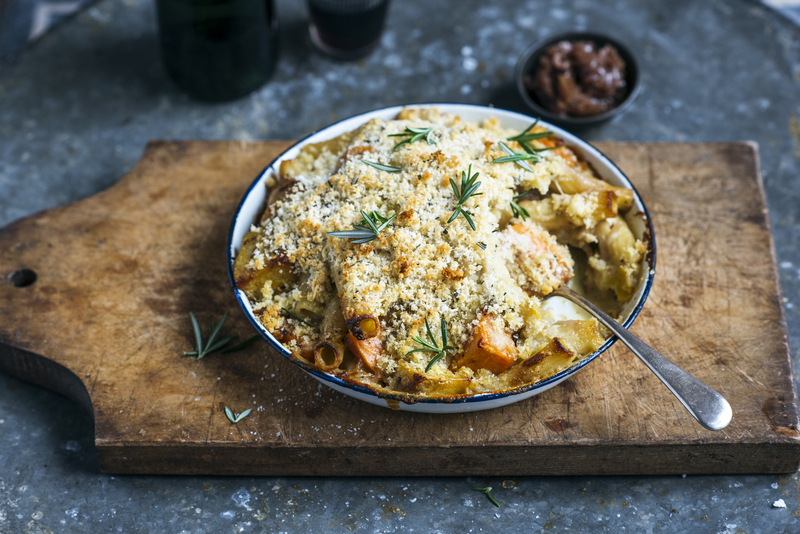 The flavours are some of my old favourites – sweet kumara and caramelised onion, sharp salty blue cheese and fragrant, fresh rosemary all bound in a silky cheesy sauce with big tubey pasta – cooked ’til golden with a fine crumbling of crunchy crumbs on top. It is making me hungry just writing about it…(gurgly stomach noises in protest). Heat olive oil in a big heavy based pot. Add onions and salt and cook over a medium heat for 25-30 minutes until nice and soft, stirring every once in a while so that they don’t catch on the bottom. In between stirring, half cover with the pot lid – I always rest it on the wooden spoon laid across the top of the pot, so it is mostly covered, but not completely. After half an hour add balsamic vinegar and sugar, remove lid completely and cook a further 10 minutes, stirring occasionally. If you like a little heat, throw the chilli flakes in now too. Once you add the sugar the onions will brown up more and go more caramelisey – if your heat is a little low, you might want to increase it a bit now. If the onions seem a little dry add an extra tablespoon of olive oil and stir through then season with salt and black pepper. Leave to cool then spoon into a sealable jar or container. Preheat the oven to 180˚C (350˚F). Peel and chop the kumara into roughly 4cm pieces and put in a roasting dish. Drizzle with oil and honey and sprinkle with cumin seeds, chilli flakes, sea salt and freshly ground black pepper. Roast for 15 minutes until just soft. Heat three tablespoons of the butter in a saucepan over a gentle heat until just melted. Whisk in the flour then add the milk in three lots, stirring continuously, until well incorporated. Add salt, pepper and nutmeg. Whisk while cooking over the heat until the sauce is thickened and smooth. If it misbehaves, just whisk it vigorously again until smooth – it should finish thick and silky. Add the cheese at the end of heating and stir well to combine. Cook the pasta for one minute less than the packet instructions advise, in plenty of salted, boiling water until only just al dente. Drain well. Add the drained pasta and cheese sauce to the kumara, add onion and stir to combine. Spoon the pasta mixture into a 25cm x 30cm baking dish. Roughly chop the bread and put in a food processor with the remaining butter, rosemary leaves and the tablespoon of cheese. Whiz to form crumbs and sprinkle over pasta. If you are a hard-core blue cheese fan, now is the time to add the rest of it crumbled on top, but it is also great ‘as is’. Bake for 20-25 minutes until golden. Serve sprinkled with reserved rosemary leaves. I saw this recipe and immediately knew what I wanted to eat for dinner tonight! Such a good comfort recipe! Really enjoyed eating it! Hey Sarah! New visitor to your blog here! I’ve tried some lovely recipes of yours in Dish which I subscribe to and just read the excerpt from your new book in the current issue. I’m over in Aus and love NZ and your food and wine scene. Anyway made this for dinner tonight and it was easy enough to do with a 3 month old and my husband, three year old and I all LOVED it. Thanks so much!